Wait, (lie) down or sit or stay - stop, but remain with that contact on the stock...don't take it off by leaving. Cast - gather the stock into a group. Good working dogs will cast over a large area. This is not a command but an attribute. Get out or back - move away from the stock. Used when the dog is working too close to the stock, potentially causing the stock stress. Occasionally used as a reprimand. Keep Away or Keep - Used by some handlers as a direction and a distance from the sheep. Bark or speak up - bark at stock. Useful when more force is needed, and usually not essential for working cattle and sheep. Look back - return for a missed animal. Also used after a shed is completed and rejoined the flock or packet of sheep. In here or here - go through a gap in the flock. Used when separating stock. These are not the only commands used: there are many variations. When whistles are used, each individual dog usually has a different set of commands to avoid confusion when several dogs are being worked at one time. 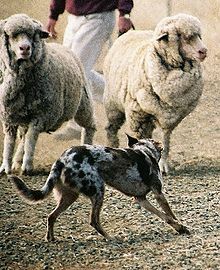 Herding dogs are often chosen as family pets. 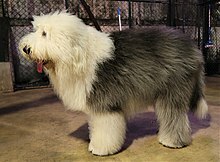 The collie breeds including the Bearded Collie and Border Collie are well known, as are the Welsh Corgis. They make good family dogs and are at their best when they have a job to do. These dogs have been bred as working dogs and need to be active. 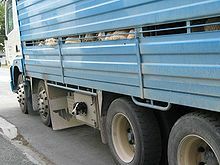 They retain their herding instincts and may sometimes nip at people's heels or bump them in an effort to 'herd' their family, and may need to be trained not to do so. Their activity level and intelligence makes them excellent canine athletes. The Australian Shepherd, Shetland Sheepdog, Rough Collie, Smooth Collie and Old English Sheepdog are more popular as family companion dogs. Old English Sheepdog at a dog cafe in Bangkok. ^ a b c d e f g Renna, Christine Hartnagle (2008). Herding Dogs: Selection and Training the Working Farm Dog. Kennel Club Books (KCB). ISBN 978-1-59378-737-0. ^ a b c Hartnagle, Jeanne Joy. Herding I, II, III. Canine Training Systems (CTS). ^ "Sheep Herding Dogs". RaisingSheep.net. Retrieved 18 April 2015. 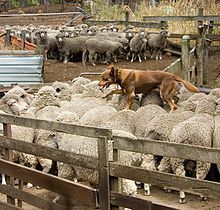 Wikimedia Commons has media related to Herding.